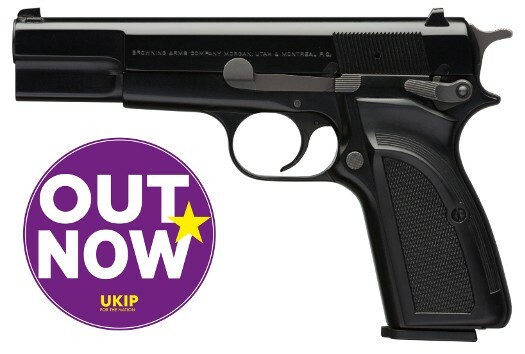 The British Gazette » UKIP: Coping with insanity. Or not, as the case may be! In his column in today’s Daily Mail (http://www.dailymail.co.uk/news/article-4935282/Mystery-man-s-win-sign-sanity.html), Quentin Letts opines that the election of Henry Bolton as UKIP’s new leader causing Anne Marie Waters to come second may be a sign of sanity. Mr Bolton is a former British Army officer. He will recognise therefore the sidearm in the image above. It is a 9mm Browning automatic. The standard sidearm for officers when he was serving. Mr Bolton should understand that the policy his party is advocating would have the same effect on the British economy as pressing the Browning’s barrel against his temple and discharging a round! Here is a FACT: The WTO route, as such, is not workable – at all. Not least, it does not deal with customs agreements which are a vital part of any trading relationship. The template for these agreements is produced by the World Customs Organization (WCO), Rue du Marché, 30 B-1210 Brussels, Belgium – not the WTO. There is a fatal misunderstanding about the WTO option. Unlike the EU, its agreements do not have direct effect. In order for them to take effect, members must themselves create their own administrative and judicial frameworks and then make agreements with their trading partners for their mutual implementation. As such there isn’t a WTO option as such. It’s better described as a “unilateral option” – i.e., working alone without agreements with others. And that simply isn’t an option. Were UKIP’s policy of ECA 1972 repeal be undertaken, not even giving the 3 month notice required by Article 65 of the Vienna Convention on Treaties then the UK would “Brexit” without ANY arrangements put in place and will have pissed off the EU so comprehensively that they would be in no mood to make arrangements. Even if the EU did agree to make agreements they could not be done quickly! To repeat: Leaving without any arrangements is to invite catastrophe! It is the act of a lunatic, a madman. Suffice it to say, IF there is a crash Brexit, UKIP is finished. It will be like Jacob Marley – as dead as a doornail! Needless to say, these warnings will fall mostly on deaf ears. What the British Gazette has been saying is widely rejected as “remoaning” by UKIP activists. In the August 2017 edition of “Independence” the UKIP magazine the back cover featured the announcements of a New Leader, New Brand and New Future. We’ve addressed the question of the leader, as to the brand, this presumably is UKIP’s new logo, viz: It appears that UKIP is going to have to deal with lawyers from the Premier League! As to the “New Future”, this depends on what happens with Brexit. To repeat, a crash Brexit will finish UKIP. Working on the Dystopian hypothesis of a crash Brexit, what might some UKIP activists do? Well, there may be many who will have voted for Anne Marie Waters who will decide to form a new party around her leadership. Indeed, some may not wait for a crash Brexit but they and AMW may decide to leave before a crash. There is one thing that will be obvious assumption to make of such a new party: It’s focus will be on the nature of the changing demographic of present day Britain and the influence of Islam in present day Britain. As to the name of the such a new party. That too is obvious: Alternative for Britain (AfB). As to the reaction of the other political parties and mainstream media, this too is obvious: overwhelmingly critical! The new party, it’s leader and it’s members would be labelled “far right”. Were a collection of individuals to consider setting up such a party they would have to accept that they will receive the opprobrium of many. They could expect to receive the critical attention of “Hope Not Hate”. They would help themselves were they to pursue a do-able Brexit strategy. First Stage: Leave the EU, re-enter EFTA and continue membership of the EEA but leave the EU Customs Union. Second Stage: Develop trade relations with the world outside the EEA and move towards a situation where the EEA changes as the UK desires or develop a new relationship with the EEA or it’s replacement. This could take decades. First Stage: Leave the EU, enter a transition period of “temporary associate EU membership” which means remaining in the EEA and the Customs Union, having the ECJ as the authority whilst being outside the EU. In point of fact this means that to all intents and purposes the UK would be de-jure out of the EU but de facto inside the EU. This is what the British Gazette has described as purgatory. The time period to be spent in purgatory would be around two years. During that time the government would be able to negotiate entry into EFTA and set up the bureaucracy to cope with leaving the Customs Union. Second Stage: re-enter EFTA and continue membership of the EEA but leave the EU Customs Union. Third Stage: Develop trade relations with the world outside the EEA and move towards a situation where the EEA changes as the UK desires or develop a new relationship with the EEA or it’s replacement. This could take decades. Some UKIP activists may say: what is the point of leaving the EU in this way. Remaining in would have been little different. Au contraire mon ami! Remaining in would have eventually forced the UK into the Eurozone.